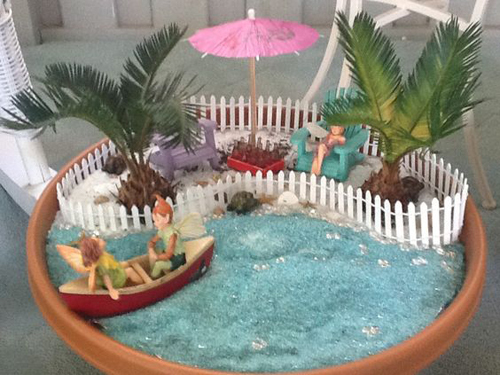 Creating a mini fairy garden in a fun container has become very popular. They are basically a new take on the old terrarium ideas of years gone by. 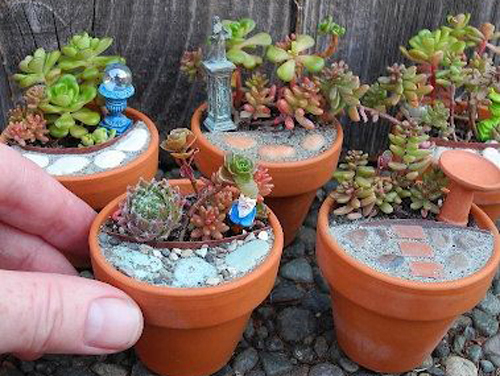 What makes these extra special is all the miniature goodies that you get to place in the pot with the plants. Little things like benches, water features, houses, walking paths, stone, mini birdhouses, all things that are miniature and fairy like. First you want to find the container. We have seen everything from a terracotta clay flower pot to picnic baskets, wheelbarrows, tea cups, boxes, suitcases, purses, colorful glazed garden bowls, metal cans, and pretty much anything you can think of. Next add soil and please use potting mix not dirt. Select your plants. Herbs, ferns, bonsai trees & bushes. Make sure it's miniature and you can keep it small. Then add your fun and playful accessories. Seating areas, paths, fences, furniture, and tables. Use natural materials like reeds, rocks, raffia, twigs, bark. A small mirror makes a great reflecting pool. You get the idea. 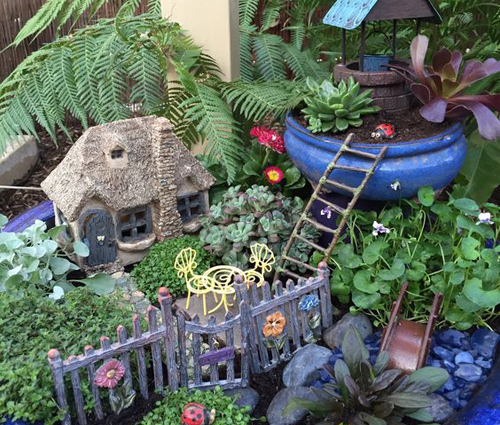 Fairy Gardens should have a taste of whimsy.. This isn't the time for being realistic. Use seashells, marbles, buttons and bottle caps for stepping stones. Finish off with a few touches and that should do it. Keep it clean, watered and replace items as necessary. These are perfect for a patio table or any garden area where you want a touch of playfulness. Read more.....Plant a mini cactus garden.